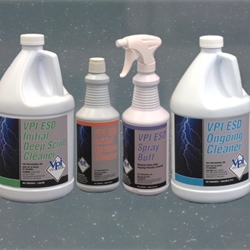 VPI 04201Q ESD Initial Surface Cleaner - Micro Parts & Supplies, Inc. Description: VPI ESD Initial Surface Cleaner is the second step in the overall VPI ESD Flooring Initial Maintenance System. VPI ESD Initial Surface Cleaner, used in conjunction with the VPI ESD Initial Surface Cleaning Pad (natural in color, with black strands) – micro-cleans the surface of the tile resulting in a great visual appearance and optimal performance. It should be used only after the ESD Initial Deep Scrub process is completed.